Residential Solar Panels to Generate Hot Water -Should I Get Some? Solar Panels that Generate Hot Water. Residential solar panels are becoming more and more popular here in the UK. 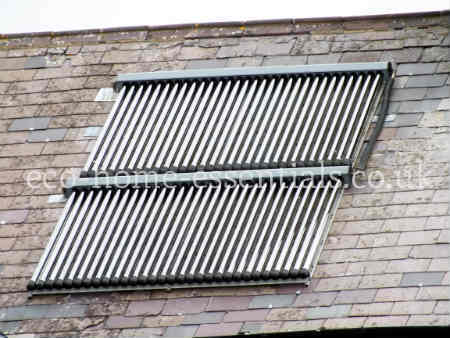 Solar thermal panels - these provide hot water for washing etc. Photovoltaic panels - these provide electricity. In this section I will be dealing with solar thermal panels which produce hot water as I look at photovoltaics in a separate section. Solar thermal panels use energy from the Sun to heat a fluid in the solar panels which in turn heats the water in your house. I appreciate this is a very simplistic explanation but I will elaborate on the workings of solar panels as we go through this section. Despite the common misconception, residential solar panels for domestic installation in the UK and Ireland will work in our cloudy overcast skies. Modern panels do not need direct sunlight in order to produce hot water. Although they will work more efficiently if exposed to direct sunlight, facing south and at an elevation of around 40 degrees. Solar hot water heating - a more in depth explanation on how a solar hot water system can benefit your property whether it's a new house or an existing one, and what you should look for in a system. Cost of solar panels - the cost of solar panels is relevant as you need to know that your investment will offer you an adequate payback period. Advantages of solar panels - by understanding the advantages of solar energy you can weigh up the costs of installation against the environmental and financial benefits that solar heating can bring. Disadvantages of solar energy - equally as important are the disadvantages of solar energy. As with all eco technologies solar is not without it's shortfalls. Read this before making you final decision on solar panels. Solar energy grants in the UK and N. Ireland - you'd be foolish to overlook the grant aid available to help with the installation of your thermal solar panels, as it will help reduce your payback period and your initial outlay. The level of grants will vary from time to time and from region to region. Residential solar panels are becoming more popular as new suppliers and manufacturers appear all the time. As a way of reducing your carbon footprint and protecting yourself from soaring fossil fuel prices they are hard to pass by. Plus they can make sound financial sense by giving you a satisfactory return on your investment (sometimes significantly greater than leaving your money in the banks). However, as always it will pay dividends to arm yourself with as much information as you can prior to approaching the suppliers. Home Page › Residential Panels.